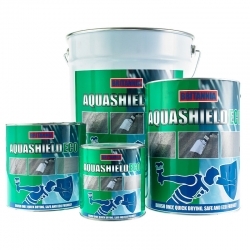 The range of waterproof roof coatings, sealants and roof paints stocked at Rawlins Paints have been developed and designed to protect and decorate your roof. 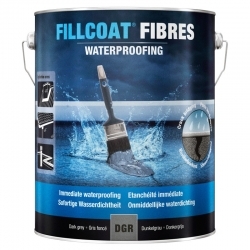 From waterproof roof coating products for both pitched and flat roofs, to paints that provide joint reinforcement and protection for felt, metal, concrete, timber and many more surfaces. Our waterproof roof paint products can be used on sloped roofs, gutters, balconies, metal and Plastisol cladding roofs, and flat roofs. Rawlins Paints understand that large roof area projects can be daunting to take on yourself, that’s why we offer comprehensive advice on how to prepare your roof, where to hire the equipment from, the best way to apply your roof paints and waterproofing coatings - and if you’re still not sure, we’ll even recommend one of our approved applicators to come and do it for you! Using waterproofing roof paint and flat roof coatings are great ways to extend the lifespan of a roof in a cost effective way. Our systems are easy to apply in a wide range of temperatures and weather conditions, they dry quickly allowing the structures to be back in service with minimal delay. ‘Cold’ applied, seamless waterproof protection – No need for heat or naked flames. Tough and elastomeric to withstand thermal/structural movement. Solar reflective coatings, instant leak repair, asbestos encapsulation, metal protection, & more! 5, 10, 15 and 25 year systems for flat, metal, pitched, corrugated and tiled roofs, balconies and more. Click here for a recent Rawlins Paints blog post on how to find the hole and fix a leaking flat roof. 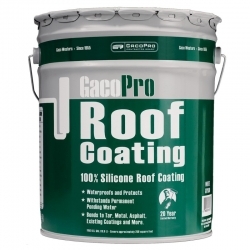 GacoPro Roof Coating is a silicone roof paint for pitched and flat roofs. It can be used any time of year and guarantees a waterproofed roof for 20 years. GacoPro Roof Coating is a liquid coating that can be applied without a primer to asphalt, asbestos, steel, concrete, lead, fibreglass, modified bitumen, plastisol, aged or weathered felt and most existing roof coatings, among others. Applying GacoPro to a roof or gutter is an economical way to extend the life of the surface, without needing to totally reinstall. Using GacoPro Roof Coating in Solar Reflective White will reflect a high percentage of the sun’s rays, therefore reducing damage caused by UV rays, which again extends the life of the roof surface. It is also available in Light Grey and permanently protects the roof from leaks, severe weather and ponding water. 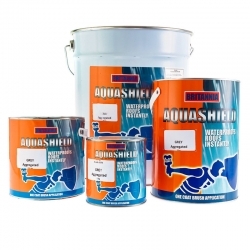 For a kit that can quickly and easily repair cracks, leaks and areas that are letting in water, Rust-Oleum Waterproof kit is a good buy. You can even use it while the weather is bad, to make sure that any leaks in your roof don’t get any worse! 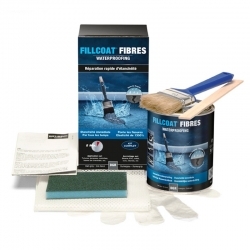 Rust-Oleum Waterproof is a water sealant with fibres. It immediately waterproofs roofs, felt, slate, asphalt, hard PVC, glass, tiles and aluminium, among other surfaces. 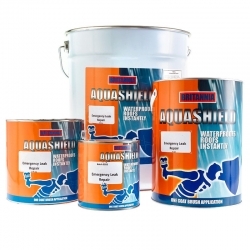 You can also buy the Rust-Oleum Waterproof Roof Paint in single tins. 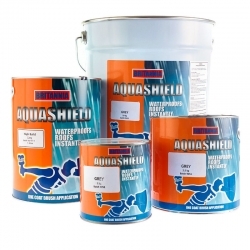 ­­­Other products in this range include Rust-Oleum LeakSeal and Rust-Oleum Leak Stop, both designed to quickly and effectively repair leaks and cracks, making them watertight and sealing them from any water damage. 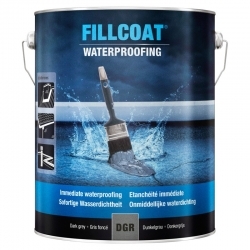 We have next day delivery available on an assortment of smooth and seamless waterproof coatings for general maintenance work on both pitched and flat roofs. The level of protection provided by these coatings is detailed in product datasheets, and for some coatings includes solar reflective and UV resistant qualities to further extend the lifespan of the roof. A product specifically designed for flat roofs is Rust-Oleum Mathys Dacfill HZ. It is a water-based system with a built-in fleece. It’s waterproof and promises to seal against ponding water within just one hour of application. It can be applied on almost any substrate and has a 15-year life expectancy. This flat roof coating resists UV radiation, heat, frost and pollution and can withstand major changes in temperature. There are various reflective paints in our product portfolio, specially developed to reduce the damaging effects of solar heat on roofs. Blackfriar Professional Solar Reflective Paint is specifically formulated to be used on dark coloured roofs. It can be used on metal, concrete, brick, bitumen and many more surfaces. It is self-priming, needs two coats and is for outdoor use only. Coo-Var Solar Reflective Paint White is a bright white acrylic aggregated roof coating. It works by deflecting sunlight to lessen heat build-up inside and outside a building. 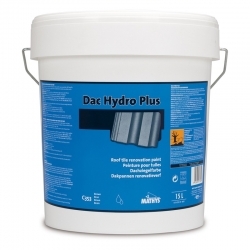 It’s suitable for stable felt, wood, brick and concrete but can’t be used on roofs that often have standing water.